Hyderabad, capital of the Indian province of Andhra Pradesh, is a bustling city which has sustained its traditional ways. The town is proud of its legacy of more than 400 years which has translated into an array of glorious monuments and evocative museums. Hyderabad, which has earned the epithet of the Istanbul of India, is a place of dualistic character, manifesting both Hindu and Muslim traditons. 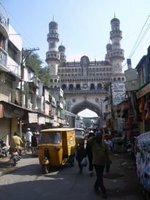 Old City - The Old City lies mostly along the banks of the Musi, Most historical attractions, including the Charminar and the Golconda fort lie in this district. It is also one of the most crowded areas of India, where, in some ways time has stood still since around 1800 while in other ways it has taken a few awkward steps forward. The crowded bylanes of the Old City are great areas to shop for bangles, henna, clothes or pearls. Secunderabad - The district lies to the north-east of the Hussain Sagar. At one point, Secunderabad was a separate city, which is why you often hear the appellation "Twin cities" to refer to the region. Like the typical Indian cantonment town, the roads are better maintained and broader. It has nice parks, open spaces like the parade ground, and some excellent restaurants. Hussain Sagar - The district around the Lake, particularly to the south of it, developed after Independence to house the government offices of the capital of the new state. The Lake itself and its surroundings have been beautified in the last two decades and you will find some nice amusement parks, promenades and restaurants around it. Jubilee Hills to Punjagutta - To the west of the new city are the prosperous suburbs of Punjagutta, Banjara Hills and Jubilee Hills. Banjara Hills is where Hyderabad's swish set lives - the industrialists, movie stars and politicians. The neighbourhoods contain some good parks and restaurants. Cyberabad - 9 kilometres to the west of the new city is the technology hub of Hi tec city and Gachibowli. Most information technology and business process outsourcing (BPO) firms have their offices here; some like Microsoft, Oracle and Infosys have large campuses. The crowd here is cosmopolitan, the restaurants and bars hipper, and the attractions worth seeing are newer. North Hyderabad - This is something of an industrial and suburban zone. Pharmaceutical companies have their factories, and their middle-class employees stay here. Other than the occasional park and the odd restaurant, the only time people from the heart of the city will visit this place is when they are driving to one of the resorts on the outskirts of the city. East Hyderabad - Home to Osmania University, the eastern part of Hyderabad is a vast suburban area that has little to interest the traveler. Golconda Fort - This is one of the most famously known monuments in Hyderabad. It is a majestic monument located on a granite hill 120 metres high. The fort has 8 gates which are called darwazas in local language. The fort was built by Qutub Shahi monarchs who built the fort during the 16th century. Within the fort, there are cannons, chambers and halls, temples, mosques, stables etc. A unique Sound and Light show is held at the fort in the evenings in English and regional languages. The show takes you back in time, when Golconda was all life, glory and buzzing with activity. Char Minar - Char Minar, another well-known structure in Hyderabad, is an Islamic architectural splendor. Built in 1591, it is a wonderful monument with its four arches which are proportionally planned. The minarets of Char Minar are more than 55 metres high and have double balconies. Paigah Tombs - These are the tombs of the several generations of the Paigah nobles of Hyderabad. These nobles had close relations with the Nizams, the rulers of Hyderabad, and enjoyed high social status. The tombs are specimen of extraordinary artistry. Geometrical patterns and designs of these tombs are unique. Salarjung Museum - One of the oldest museums in India, Salarjung Museum holds great collection of rare antiques. The museum has collection of approximate 40,000 items, which have been brought in from every possible place in the world. Portraits of Salar Jung, the Nizam of Hyderabad, are in the Founder's Gallery. Specimen of Indian art are in the form of stone sculptures, wooden carvings, miniature paintings, modern art, ivory carvings, bronze images, painted textiles, jade carvings, metal-ware, manuscripts, arms and armor etc. Carpets, manuscripts, glass, metal-ware, lacquer etc are here as the representative of Middle East art. Mecca Masjid - One of the largest mosques in India, Mecca Masjid has a capacity to accommodate about 10,000 worshippers. Sultan Muhammad Qutub Shah started the construction of this mosque and the work continued during the reigns of Abdullah Qutub Shah and Abul Hassan Tana Shah and was finally completed by the Mughal Emperor Aurangzeb in 1694. Hussain Sagar Lake - Constructed during the reign of Ibrahim Quli Qutub Shah in 1562, this huge lake in the centre of the city has become a tourist attraction. Boating facilities are available and dinner cruises are organised by the tourism authorities. Birla Mandir - A modern temple on the shores of Hussain Sagar Lake, it provides an excellent view over the city from the summit. The magnificent marble structure stands atop a hill and it is believed that the marble used in its construction was brought all the way from Rajasthan. Ramoji film city is a perfect day long excursion from Hyderabad. It has been certified as the largest film studio complex in the world by the Guinness World Records. Shuttle bus services are available from the city centre to the complex and inside the film city complex guided tours are available for various events and shows. Hyderabad has a tropical climate with hot and humid conditions prevailing for most parts of the year. Fortunately though, there is a dry season from November to May when there is just around 10-25mm of rain a month, against 125-175mm of rain a month between June and September. During the dry season, temperatures are around 30 °C during the day, but rising to an average of 40 °C in May, just before the wet season starts. During the wet season, temperatures are mostly between 30 and 32 °C. Nights range from 15 °C in December and 27 °C in May. The best time to visit the city is from November to February, when the weather is dry and temperates are moderate (around 25 °C). Hyderabad International Airport, located around 25 kilometres from the city centre, handles both domestic and international flights. Domestic flights are available to all the major cities within the country, including Delhi, Mumbai, Ahmedabad, Aizwal, Bangalore, Chennai, Pune, Tirupati, Visakhapatnam, Bhubaneswar, Jaipur, Kochi, Kolkata, Lucknow, Raipur, Thiruvananthapuram, Aurangabad, Bhopal, Goa, Indore, Rajahmundry, Vadodara, Hubli, Nagpur, Tuticorin, Agartala and Coimbatore. International destinations include cities such as Dubai, Sharjah, New York, Dammam, Jeddah, Frankfurt, Riyadh, Singapore, London, Abu Dhabi, Muscat, Kuala Lumpur, Doha, Bangkok and Chicago. There is a non-stop air-conditioned shuttle bus service available from the airport to the city centre. These buses run at 30 minutes interval to/from several points in the city and the airport between 3:30am and 11:30pm hours, and at a 1 hour frequency between 11:30pm to 3:30am. Andhra Pradesh State Road Transport Corporation (APSTRC) also provides non air-conditioned bus services between various points in the city and the airport at much lower fares. A dedicated train service is also being constructed, which is expected to be operational in a few years time. Hyderabad is a major railway junction and is connected with train services to all the regions of the country. Hyderabad has three main railway stations: Hyderabad (Nampally), Secunderabad and Kachiguda. Tourists are advised to check the station name printed on the ticket to avoid any confusion. Train timings, fare and availability of berths can be checked at the official Indian Railways website. Hyderabad can be easily reached from the nearby cities by taxi as the road condition is good. The roads on the Hyderabad-Chennai and Hyderabad-Bangalore are particularly in excellant shape. Hyderabad is well connected by buses with other cities of the state as well as important cities of the neighbouring states. Both luxury and normal buses connect the city to Bangalore, Pune, Chennai, Goa and Mumbai. The government controlled APSRTC has a good network of buses operating in the state. These are safe, relaible and tickets on some routes can even be booked online. Private operators also have a range of services from the city. Metered taxis are available, but they cannot be hailed off the street. One needs to call their centralized call centre and book the service. Service is very good, especially if you are booking for longer distances. It can be next to impossible to be able to get a taxi without prior booking since demand far outstrips the supply. All metered taxis have digital meters that show the distance and fare. Travellers aware of Uber taxi services can avail Uber cab services in Hyderabad using their smartphone. A similar service "Ola" is also available via smartphone application to cruise through Hyderabad. Operators offering metered taxis at ₹10 per km (Most of them are now charging ₹12 per km for an Indica, ₹10 continues in case of Maruti Omni) with a minimum charge is ₹80 in most cases. Many taxi services prefer not to book trips that are only a short distance. Autorickshaws in Hyderabad should be metered, though it can be difficult for non-locals and locals alike to find an auto-rickshaw driver who ever agrees to a metered fare. (This is especially true when hailing an auto in front of a 5-star hotel and near Hi-Tech area.) However, Traffic police are very helpful and will help engage an Auto with metered fare. Autos can carry a maximum of 3 passengers excluding the driver, but it is common to find them being overloaded to carry up to six passengers. The minimum fare is ₹20 which covers the first 1.6 km. Each additional km is another ₹11. There are also shared 8 seater Maxi Vans available to and fro from the suburbs to a main location of the city in that direction. Fares are mostly ₹2 more than bus fares, but are far more comfortable and fast for short distances up to 5 km. Fix the fare before you step into the auto-rickshaw. Auto Drivers in Hyderabad are a nightmare and are absolutely uncooperative. Finding a needle in a haystack is easier than finding an auto driver who agrees to go by the metered rate with a common excuse that their meter is not functioning. They always demand a much higher fare even though the fare has been increased from ₹12-14. It is advised to keep extra change with you since most of the auto drivers will claim that they don't have change, even if they have. If you have a choice then always opt for a prepaid cab. Reckless driving and accidents are very common in this city. Most of the auto drivers want you to check out Govt. Authentic pearls shop in exchange for a lower fare; however, they are okay if you don't buy anything from these shops, just sit there for 10 minutes. They get 25 kg rice if they take 15 customers to these shops. The pearl shops are notorious for persuasive sales tactics and they won't let you out easily. So pay the complete fare to auto drivers instead of being diverted to a pearl shop. Auto drivers get some percent of the entry fees (around ₹10) if they take you to the places like Chow Mahal or Salarjung museum for free. If you are around these areas get into some auto instead of walking down and ask them to drop you there. Local trains called MMTS are available, albeit for only a few places in Hyderabad. The frequency ranges from 10 minutes to around 2 per hour, save the daytime and Sundays when there are fewer trains. It is a fast way of travel to the few stations it covers, and the cheapest option as well. If you plan to travel through MMTS, check out the schedule from the website. It is advisable for foreigners to take first class. Daily, monthly and quarterly passes are also available at the MMTS stations. Hyderabad has good local bus connectivity and is run by TSRTC, a state-government owned corporation. Most buses start at the Mahatma Gandhi Bus Terminus more commonly known as Imlibun. Apart from normal local buses, you have a choice of Metro Express and Metro Deluxe aka Veera. There have also been air-conditioned buses all over the city (minimum fare ₹22). Local buses tend to get extremely overcrowded and traveling on the footboard of a bus is very common. As of 2011 a fleet of new, more comfortable, buses include blue-liveried Tata Marcopolo buses of the Metro Deluxe class and the City Sheetal buses (Volvo or Tata Marcopolo). They are air-conditioned and have limited stops. They are not crowded and you can get a seat most of the times. The routes displayed on buses are normally shown in at least two languages, one of which is English. The best way to get to a location by bus would be to get to a bus stop and ask people waiting there. You could also get into a bus going in your direction and ask the conductor for help. Hyderabad's interesting districts are fairly spread out, but are enjoyable to explore by foot on their own. The Old City is composed of a maze of disorienting alleyways that expand outward from the Charminar. Getting lost in the markets (where you can buy anything from hand-sequined saris to freshly slaughtered goats) and alleyways in the Old City can make for a thoroughly enjoyable afternoon. The famous Chudi Bazaar (Lad Bazaar) across from the Charminar is a chaotic tumble of goods, people, animals and vehicles are navigated quickly on foot. The Chowmahalla palace and the Mecca Masjid are both easily accessed from the Charminar. Necklace Road, Sultan Bazar (Koti) and Abids are worth taking some time to wander around. Please note that walking can be hazardous in Hyderabad. It is common for roads to be missing pavement, or simply unpaved, and bikes and auto-rickshaws may go to right up to the edge of the road and climb any barrier to get ahead in traffic. Walking alongside and crossing the road can be very dangerous and it is important to stay alert for erratic driving. It is always advisable to use the foot-over bridge if there is one available. No visit to Hyderabad would be complete without sampling its unique cuisine - a rich blend of royal Mughlai flavours, Nizams special, and spice-up culinary traditions of South India such as: Hyderabadi biryani, pathar-ka-ghosht, nahari, haleem, double-ka-meetha, khubani-ka-meetha, seviyon-ka-meetha and kheer. A popular dish of Hyderabad is biryani. It is prepared with a blending of Mughal kitchen and the style of cooking practised by the Nizams. Hyderabadi biryani has a distinct aroma. Garnished with pudina, fried onion & boiled eggs. Mostly it is served with dahi-ki-chutney and mirchi-ka-salan. Biryani has many variants like mutton biryani, chicken biryani, biryani khaam, biryani zard or zafrani or the most exotic of all joban malti biryani in which mutton, partridges and quails were cooked with rice. Recently there has been an explosion in the number of restaurants in Hyderabad, fuelled by demand from young professionals with money to spend. Quality and variety of food, however, has not kept pace. There is a disproportionately large number of restaurants that aspire to be called "fine-dining" restaurants, but the food they serve is usually indifferent. In general, keep away from restaurants that call themselves "multi-cuisine" or if you see multiple cuisines on the menu, as the chances are that they are attempting to serve every kind of palate and will not satisfy any. The older areas of Hyderabad are better places to find good and cheap food. Places close to Hi tec city, such as Madhapur and Kondapur, tend to have expensive and bad food, while in Banjara Hills and Jubilee Hills you will find restaurants that are expensive, but which sometimes serve good food. Those misled by the fact that Hyderabad is in South India and expecting South Indian food may be disappointed. While there are excellent South Indian restaurants in some of the older areas like Koti and Abids, the average South Indian food served here is quite bad. Two of the biggest names in Hyderabad's restaurant business are Ohri's and the BJN Group. It will seem as if every second restaurant in the city is run by either one or the other. BJN generally runs upscale restaurants, while Ohri's runs both upscale and mid-range restaurants. It also runs numerous fast food places all over the city, including at Prasad's Imax, Banjara Hills, Somajiguda, EatStreet, Hyderabad Central & Basheer Bagh. There is plenty to do at night in Hyderabad, though local regulations have most places serving last drinks by 23:00. On weekdays, drinks in the some of the pubs have best offers, as most clubs are empty until Thursday or Friday nights, when the clubbers emerge. But the sheer number of nightlife spots makes it hard to choose which ones to list. As a general rule they tend to be clustered around Begumpet and Road No.1, Banjara Hills. Warning: Drunken driving is not tolerated and police enforce the rule strictly. After 23:00 almost all the roads have police patrols and check drunk driving. If caught you may end up paying fines, apart from vehicle being seized and couple of rounds to police station in worst scenarios. Accommodation in Hyderabad is unlikely to bust your budget, especially when compared to cities like Mumbai or Bangalore, and rooms are usually easily available. However, because the city sprawls so much, you need to be careful about the hotel location if you want to avoid a long commute and traffic bottlenecks. Plentiful budget accommodation is to be found around the Nampally railway station and in Abids, Koti and other new city areas for a few hundred rupees a day, and tourist attractions aren't very far off. However the facilities tend to be basic, the towels aren't necessarily clean and air-conditioning tends to be extra. It might make sense to pay a little more and choose mid-range accommodation. The area around Hussain Sagar Lake, Begumpet, Punjagutta, Somajiguda, Banjara Hills and Lakdi-ka-Pul are close to both tourist attractions of the old city and the business areas of the new city. Hotels in Secunderabad might be slightly far for the tourist, but may still work for the business traveller. We have a comprehensive list of accommodation in Hyderabad searchable right here on Travellerspoint. You can use our map to quickly compare budget, mid-range or top of the range accommodation in Hyderabad and areas nearby. This is version 54. Last edited at 15:36 on Nov 20, 17 by Utrecht. 30 articles link to this page.